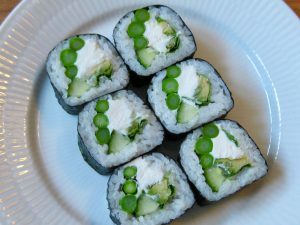 Learn to make delicious and tasty vegetarian sushi that tastes better than sushi with fish. Vegetables are exciting ingredients to work with because they have different tastes and a different consistency than fish. Vegetable sushi is more challenging to make as other cooking techniques are used in the preparation of sushi. The Japanese omelet Tamago is velvety and spongy when it is made to perfection. It’s quite complicated to make, but it can be explained in a simple way. Of course I will show you how to do it. What do you learn at the course? You get an introduction to vegetarian sushi and, the benefits of eating vegetarian sushi a little more often. You get an introduction to which vegetables are best suited for vegetarian sushi. You learn to handle the various steps for boiling sushi rice. You learn to cook sushi rice according to Japanese cooking techniques. You work with cooking techniques of different degrees of difficulty such as grilling and steaming. You work with different Japanese cutting techniques and sliced ​​different vegetables and other ingredients for sushi. You learn to mix the perfect Japanese omelet dough. Step by step you learn to make the Japanese omelet Tamago. You learn step by step to make hosomaki (small roll), uramaki (insite-out) and futomaki (big scroll). 2 hours of intensive teaching. You learn to make the Japanese omelet Tamago. You make an atomaki (small roll), uramaki (insite-out) and futomaki (big roll). A total of 22 pieces of sushi that you bring home. You will of course be given the recipes. The course is held by the Japanese educated Sushi chef & sake sommelier Zoë Escher. There are small exclusive teams with max. 13 attendants. The class is not bigger than that there is time for Zoë to provide personal feedback. The course is also aimed at families and adults who come with a child.